Snakes are cool reptiles to have as pets. Occasionally a snake will develop the pesky problem of striking at you. If you don’t do everything possible to correct the problem, you will soon have a pet that you can no longer handle. Snakes are very simple creatures with rudimentary brains and they only bite for a few reasons. Once you know the reasons your snake is biting you it becomes much easier to avoid. Snakes, just like all other animals have a natural defense mechanism to lash out and bite when they feel threatened. This is especially true if you don’t handle your snakes often. In a nutshell – If the snake isn’t familiar with you it will fear you. If it fears you then it will very likely bite you. When it is feeding time and you start prodding around in the snake’s tank it doesn’t matter how tame it is, chances are that it will attempt to strike at you. It is only a matter of time before you get bit by a hungry snake looking for an easy meal if you don’t pay attention to the signs. If you smell like his prey sooner or later it is going to strike and bite you. Don’t handle the food and then handle the snake before washing your hands. Actually it is a good idea to wash your hands before and after handling your snake regardless of if you’ve handled the snake’s food. When all is said and done some snakes tend to be more aggressive than others which lead them to bite more often. Certain species have a tendency to be nippier. 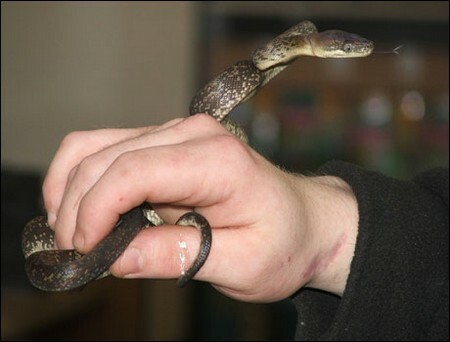 Amazon Tree Pythons for example are known for being more likely to bite. Young Carpet Pythons are known to be biters until they get used to being handled. Some snakes will outgrow it and some won’t. That’s why it is very important to research the snake you plan to buy and have a thorough understanding of the type of animal it is genetically.